Historically, the body has been at the center of religious and philosophical discourses on “the human”. From its allegorization as the mystical body of Christ (St. Paul, St. Augustine) to the body-mind dualism of Descartes (1647, 1649), the body has been a trope through which the relations between the internal and the internal crystallize and dissolve. the external, the subject and the object, nature and culture, inclusion and exclusion. Likewise, the body has been a recurrent metaphor for political organization and social integration in texts such as El leviatán by Tomás Hobbes (1651). And thinkers like Michel Foucault (1963, 1975, 1976-84) have dismantled the binary construction of body / soul-mind, through concepts such as bio-power, the disciplinary society and the docile body, through their studies on the relationship between the body and the power. More recently, several authors have recovered Foucault’s ideas to develop a broader theory of biopolitics (Hardt and Negri 2005) and necropolitics (Mbembe 2003) in the current context. Other authors (Quijano 2000) have focused on the link between body and coloniality to reveal the complicity between the Western imaginary and the labor exploitation relations in the colony. 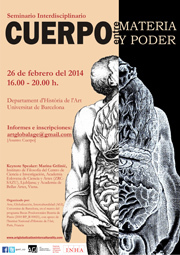 The interdisciplinary seminar “Body, between matter and power” aims to locate and problematize the tensions involved in these varied conceptualizations of the body. Raising matter and power as two polarities through which the body is mobilized, this seminar seeks to highlight the interstitial function of the body as a mediator between materiality and politics beyond the body / soul-mind dichotomy. Specifically, Body, between matter and power aims to focus on complex and problematized representations of the body in diverse media, such as: visual arts, television, film, literature, architecture, dance and theater, among others. Therefore, and seeking to highlight the interdisciplinary dimension of the seminar, researchers, postgraduate students and cultural workers are invited in the areas of: art history, media studies, sociology, philosophy, architecture and urbanism studies, and studies of the show; Send your abstracts according to the following instructions. 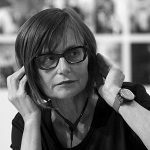 Marina Gržinić is a philosopher, theoretician and artist from Ljubljana. Professor and research adviser at the Institute of Philosophy of the Scientific and Research Center of the Slovenian Academy of Science and Arts (ZRC-SAZU), Ljubljana. Since 2003, she has also served as Full Professor at the Academy of Fine Arts in Vienna, Austria. She is a prominent contemporary theoretical and critical figure in Slovenia. For her scientific work she has received the Golden SASA sign in 2007. She publishes extensively, lectures worldwide, and is involved in video art since 1982.